The versatility and robustness of a vehicle that can handle every job you throw at it for every Cargo there's a Eurocargo. Eurocargo's outstanding adaptability to every requirement means that you'll always find the right conversion for your mission. 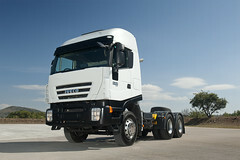 The range of possible conversions includes box vans and curtain-siders for high load capacity, temperature-controlled boxes and three-way tippers for the ease of conversion, tankers and mobile shops for agility and compact size, lift platforms, high-access platforms, fire and rescue conversions, compact concrete mixers and sweepers for cleaning and maintenance services.